Angira Rope Pvt. Ltd. Angira Rope Pvt. Ltd. Established in the year 2015, We Angira Rope Pvt. Ltd. , Dhoraji, are engaged in manufacturing, Exporting, supplying and wholesaling a board array of Ropes & Twines. Our product range Ropes, HDPE Ropes, PE Ropes, PP Ropes, HDPE Twine, PE Twines, PP Twine, Plastic Sutli, Plastic ropes and PP Baler Twine. Our products is fabricated as per industry purpose & standard using advance machines and techniques. These are widely use for varied purpose such as hunting, pulling, fastening, attaching, caring, lifting, and climbing. Our products are known for their high strength and the ability to bear bulk load. We are supported by well developed infrastructure that sprawls over a large area. Outfitted with the latest technologies and high-tech machines. Thriving under the guidance of our mentor, "Mr. Ankit Rakholia", We have carved a respectable niche for ourselves in the industry. His rich industry experience, managerial abilities and business acumen have helped us in successfully crossing every hurdle that we encountered on our way to success. It is manage by highly experienced professionals. These professional have enabled us to amass a wide client across the major markets of the Indian subcontinent, Yemen, Sudan, Tanzania, Kenya, Zambia, Madagascar, Malawi, Nepal, Sri Lanka, Morocco, South Africa, In West Africa Senegal, Benin, Gabon, Ivory Cost, Ghana, and a capital of country Accra. Mission Statement Our mission is to be the leader in the roping industry by building ropes that have the best feel and stability, conducting ground-breaking marketing, delivering promptly, and providing excellent customer service. We are Manufacturing and Exports HDPE Rope and HDPE Twines. We have 2mm to 24mm Size of Rope. Which is used for various applications. Marine, Fishing, Shipping, Household, Agriculture, Towing, Safety, Sport/ Tracking, Heavy Lifting and also used by para - military forces and defense. 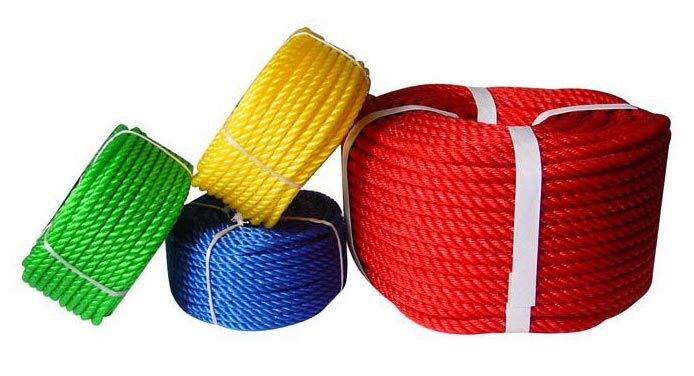 pp rope we are a manufacturer of pp rope which are very usefull to band your product or any thing what you want to carry to one place to other and it's capacity that its take so many tones or kg item carry and our market area are west africa ghana and all.